The New Age movement is hardly novel! Its philosophy is rooted in ancient traditions, often based on mystical experiences, each within a different context. Anthropologically, there have always been (wo)men within "primitive" societies who were looked upon as possessing special knowledge and power. 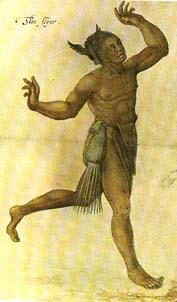 Medicine men, or shamans, had undergone a spontaneous catharsis, or were initiated and felt called upon to maintain contact with the spirit world for the clan. When communities became more complex and organized there was little place for these loners. Society began to specialize, people realized and felt drawn to form groups, guilds, or societies, to ensure continuance and growing perfection. Contact with the spirit world was given into the hands of organized religion, which also provided an established answer to questions about the unknown and the Highest Power. People who felt endowed with special powers could hardly adapt themselves to the corset of established faith. They went underground. Yet they endeavoured to contact kindred spirits and pupils willing to follow in their footsteps to pass on the work. Esoteric tradition became handed down in spiritual groups, communes, or fraternities. Their mutual devotion resulted in a high degree of perfection comparable to the guilds of craftsmen. In their mystical experiences they beheld a spiritual reality that could hardly be reconciled with the dogmatic representation given by the churches. When passing on their experiences, they had to exercise extreme caution, lest being accused of heresy. Yet knowledgeable minds would understand their veiled writings, symbolic representations, or even gestures. In spite of all hindrances and opposition, hidden (occult) spiritual tradition reached unknown shores! One of them being Europe, where interest in ancient traditions was revived at various times. Interest in these traditions alternated. After periods of decline, often as a result of cultural and political conditions, a growing need for revival of old almost forgotten values followed. The occult tradition seems so tremendously powerful that it cannot be suppressed. It develops in cycles of flourishing and decline - each renaissance with a fresh approach, adapted to the spirit of the times. Renewed interest in these spiritual, religious and magical traditions had a tremendous impact on the minds of man. The latest revival in a popularized form is that of the New Age movement in the late sixties. The 7th to 5th centuries B.C. are characterized by a remarkable global birth of religio-philosophical ways of thought of astounding profoundness: Lao-tse and Kung-Fu-tse (Confucius) in China, Buddha and Mahavira in India, Zarathustra in Persia, the prophets in Palestine and the philosophers of Greece. An attempt was undertaken by all these great sages to transcend the old myths and superstitions of their time and present an in-depth approach. An abstract, mystical way of seeing and experiencing reality was being paved. Some of these wisdom traditions became embodied in Greek culture. Western European man learnt of their world of thought through contacts with the Middle East and in particular Latin translations of Greek philosophical works. The Greeks set them also on the trail of Egyptian culture and religion. Knowledge about this great civilisation came to the Occident indirectly however in its Greek version. Actual contact with Egypt did not exist. The Greeks, in their syncretistic turn of mind, absorbed in their philosophy the essence of religious traditions that reached them from other cultures through trade or wars. Egyptian initiation rites, Thracian orphic mysteries and other ritual and cult practices were amongst the many that were adopted readily. God Hermes Trismegistus(=thrice great) was considered by them to be identical with the ancient Egyptian God of wisdom Thoth. Modern research has shown, however, that the Egyptian magical and mystical works attributed to Hermes were written in the second and third centuries A.D. These ideas became known as the Hermetic philosophy. Its most important work is the Corpus Hermeticum, a compilation of fifteen texts on astrology, alchemy, theosophy and theurgy. Of the mystery school traditions Christianity had the most impact on the West. The originally pure Jewish sect would have gone into oblivion after the Romans destroyed Jerusalem and most of its inhabitants in 70 AD were it not that it had struck root in adapted form in Jewish and Gentile communities in diaspora. On the basis of the few documents that have survived from later centuries scholars take it that a myth struck root around the Jewish wisdom teacher Joshua (in Greek Jesus). The Christianity that became of it had absorbed popular pagan religious beliefs.The qualities attributed to Jesus are a reflection of those of the gods revered at the time. Godman Osiris-Dionysus for instance, was considered a Son of God and was born to a virgin on the 25th of December before three shepherds. Gnosticism originated in Egypt. The neo-platonic Gnostic school of Alexandria became its centre in the first century A.D. From it sprung Christian, Gentile and Jewish gnosticism. The latter survived in the Jewish Kabbalah. The various Gnostic sects played an important part in early Christianity and the formation of the gospels. Their influence and tradition were suppressed when the Jesus myth had struck root. Faith became fused with the ruling power when emperor Constantine made Christianity a state religion in the 4th century A.D. and placed himself virtually at its head. Gnosticism remained a source of inspiration, however, for the few who knew of its ideas, which were kept secret. At the centre was the belief that the seen and unseen world is the manifestation of the One Divine Being. Gnostic texts concern the fall of man from the divine to the material world. The spark of divine light imprisoned in man is to be set free so that it may return to the Kingdom of God. Gnosis, intuitive knowledge, is said to rank over analytical knowledge. It was to be obtained by various initiations. Use of hallucinogens may have played a part in obtaining mystical experiences. Gnosticism influenced many heretical West-European sects, such as the Kathars in the Middle Ages, who were fiercely persecuted, and mystics as Jacob Boehme (1575-1624). In the eighth and ninth centuries A.D. Baghdad had become the great intellectual centre of Arabic studies. Scientific and philosophical books were disseminated through the Moorish emirate of Cordoba, Spain. The universities of Granada and Saragossa made translations available of the great Greek classical works from Arabic into Latin. Another tradition that reached the Occident was that of Jewish mysticism. Their esoteric doctrine the 'Kabbalah' (meaning: tradition) appeared in Jewish mystic circles in Spain and Southern France in the 12th century. Its oldest part, the Sefer Jetsira, was written between the third and sixth century. According to this belief God gave a second revelation to Moses together with the Law. It explained the secret meaning of the Law. This revelation is said to have been passed on down the ages by initiates. Kabbalistic studies in the Hebrew scriptures developed in a theosophical mystique and sometimes in a sort of unintended religious magic. Shortly before the expulsion of the Jews from Spain in 1492 Pico della Mirandola in Florence conceived a Christian version of the Kabbalah. He associated the Kabbalistic truths with those of Greek Hermeticism. Thus an amalgamy was introduced between the tradition attributed to the Greek Hermes Trismegistus and Jewish mysticism purportedly descending from Moses. The name 'alchemy' is derived from the Arabic el-kimya, Khem being the name for Egypt where it was practised even before the Christian era. It blended with the magic and mysticism of the legendary Greek Hermes Trismegistos which became known as the Hermetic philosophy. In the fourth century A.D. alchemy evolved to its historical form. Its tradition reached Europe through Muslim alchemists in Spain in the twelfth century. Mediaeval Alchemy contained Gnostic elements. In its popularized form it is considered the art of mutation of metals. Yet, it went deeper than that. It issued from the assumption that matter is alive and may grow. With the right rituals matter could be influenced to transmute into higher forms. Under the cover of semi-scientific experiments its practitioners followed a secret tradition. Thus, in its mystical sense alchemy was not a search for the philosopher's stone, the transmutation of metals into gold. Its deeper aspect was the search for purification of the soul, the mystical transmutation of the mind necessary for obtaining direct divine knowledge. There were genuine and false alchemists in medieval times. Amongst them were noblemen and common people, clergymen and laymen, Jews and Christians, scientists and simple artisans, philosophers and illiterates, doctors and magiciens, in short from all classes of society. They wandered through Europe from one place to another. They felt themselves cosmopolitans and as such held close relationships with one another. They had their secret societies, with signs and passwords. It was an oral tradition principally, from ear to ear - mouth to mouth. All that was written down was disguised in order to give the impression that it concerned chemical experiments only. In spite of their being persecuted more and more they kept practising their art secretly. Nevertheless their ideas had an indirect influence on society. 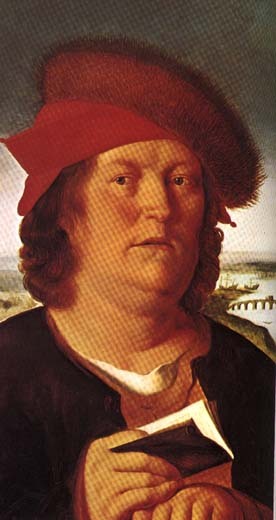 One of the leading exponents of alchemy became the Swiss Theophrastus Bombastus von Hohenheim, called Paracelsus (1493-1541). Isaac Newton, at the risk of ending his life at the stake, conducted the greater part of his life alchemical experiments. The Renaissance movement of the 15th and 16th centuries was born out of a disenchantment with the Mediaeval philosophical and theological way of thinking. A return to the source of knowledge of the distant past was being advocated. Although the Renaissance movement is usually known for its influence on art and literature, in recent years it is realized that it was also accompanied by a renewed interest in the study of old occult Neoplatonic and Hermetic traditions. The magical mystery religion of ancient Egypt, being the oldest civilisation one had any knowledge of, exercised a great fascination over the Renaissance men. The mysterious hieroglyphs were considered to be symbols of hidden knowledge revealed by God to men that could not be passed on in words. Symbols and gestures became means of conveying truths and values. The cosmos was seen as an organic unity. It was peopled by a hierarchy of spirits which exercised all kinds of influences and sympathies. The practice of magic became a holy quest, a search for knowledge, not through the intellect, but by revelation to the pure in mind. The influence of the fresh interest in wisdom traditions in the wake of the Italian Renaissance movement also found its expression in Freemasonry, which became organised in lodges around 1600 in Scotland. Modern Freemasonry springs from the Medieval stonemasons who wandered from one town to the other looking for assignments to build a church, or even a cathedral, which required enormous skill, intellectual and organizational talents. Guilds were set up in order to guard the secrets of their craft. The prestige of the architects, whose edifices were an object of great admiration, was high. Being a member of the guild was considered a privelege and had to be earned. Members recognized each other not only by passwords, but also by their devotion and philosophy which was laid down in the so called Old Charges. The earliest version of this credo of the Freemasons, dates back to 1400. Later versions circulated in the 16th century. The Old Charges embody the Hermetic quest for the lost wisdom of the ancients. The Freemasons placed emphasis on morality and the study of geometry. Ancient Egyptian knowledge and the masters behind the great architectural design of the lost Temple of biblical king Solomon were in high esteem and a source of inspiration for the development of masonic creativity. Master mason Hiram of this temple, murdered because he would not reveal masonic secrets, was a source of inspiration. Masons felt also akin to the revered building guilds of ancient Egypt, Greece, and Rome. The amazing architectural skill of the ancient builders was attributed to supernatural powers. With great devotion their treatises on geometry and mathematics were being studied when they became available. These craftsmen belonged to the "operative" side of Freemasonry. Later members of the upper classes were admitted as well to Masonic lodges. Their pursuit of occult and spiritual sciences, may have been responsible for the development of a "speculative" side. The aspiration of Freemasons for more freedom of thought, political and religious reform, made it paramount that the activities were conducted in utmost secrecy. Eventually the "operative" elements would disappear. In Scotland William Schaw (1550 - 1602) is considered to be the brain behind the re-organisation of the mason guild. In Great Britain Elias Ahmole (1617-1692) was the forerunner. In the diary of this astrologer is a record of his initiation in 1646 into Freemasonry, which already counted many members then, none of them being stonemason by profession by that time. Associated with these traditions is the Rosicrucian movement which appeared in the seventeenth century. They should not be mistaken for the modern Rosicrucian groups, which have no direct connection with the ancient movement. 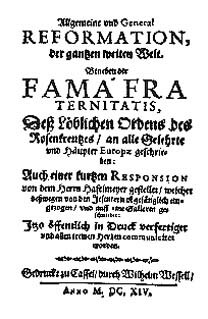 At the basis of their emergence is the publication in 1614 of a pamphlet, named Fama (see image) (of the Fraternity of the Meritorious Order of the Rosy Cross) addressed to the learned in general and the governors of Europe. Its author is presumably Johann Valentin Andraea (1586-1654), a young German Lutheran pastor. It purported to be a message from certain adepts concerned for the condition of mankind. In truth it is thought that its source was a brotherhood of disappointed Lutherans who were not satisfied with the results of hundred years of Reformation. In the Fama it was proposed that all learned men throughout the world should join forces towards the establishment of a synthesis of science. Behind this effort stood allegedly an illuminated brotherhood - the children of light, who had been initiated in the mysteries of the Grand Order. This "Brüderschaft der Theosophen" was said to be founded by Christian Rosencreutz (1378-1484), who had become an initiate during his travels in the Middle East in the fifteenth century. He founded a brotherhood which was supposed to have operated in secret ever since. The Rosicrucian manifesto created quite a stir in European circles. Although many applied for initiation there are no records of the brotherhood having survived long. By 1623 the German Rosicrucian movement was crushed under the weight of the Counter-Reformation led by the Jesuits. The occult Renaissance had come to an end. The tide of witch-hunts had begun. The grip of fundamentalist Christianity weakened in the course of the following decades. The weltanschauung of European man was ever broadening out. The world seas were being explored and contact made with other cultures. The increasing population in an expanding and more demanding society called for inventive skills. European civilization struck root. Man of genius contributed to its culture. Exploring nature with an intelligent mind became a coveted pursuit. Anna Maria Schuurman (1607 - 1678) became the first woman to be accepted as an academic. A new kind of philosophy emerged, distinct from the Christian world-view of medieval theologians. The Age of Enlightenment can be said to have begun in 1687 by the publication of Isaac Newton's; Philosophiae naturalis principia mathematica (Mathemetical Principles of Natural philosophy). It was the basis of exploring nature in an objective manner. The best minds dedicated themselves to this critical pursuit: Galilei, Robert Boyle, René Descartes, Francis Bacon. Diderot began publishing instalments of his famous Encyclopédie in 1751. Alchemy was still considered a scientific pursuit and is being described in the encyclopedia in quite favourable terms. The idea of freedom of thought emerged. Holland attracted many persecuted Jewish, Huguenot and other refugees for its liberal religious views. Spinoza in Amsterdam contributed to biblical scholarship. For the first time critical notes were placed behind biblical texts. Stripping the Bible of its holy mystery had become common place by the 18th century. Critical deism attacked and downgraded conventional Christianity. Voltaire, Rousseau, Thomas Jefferson and Benjamin Franklin are rated among the deists. The esoteric tradition had less to fear now. Towards the end of the eighteenth century new scientific discoveries and inventions had captured the public's mind. Specifically experiments with electricity gave fuel to the most amazing and weird theories involving fluïdum, ether or phlogiston to explain its wonderful properties. It is nowadays generally hushed up that the great minds of that era, like Newton, believed in heretical notions that would nowadays relegate a scientist to oblivion by the academic community. In the eighties of the 18th century an Austrian spirit healer, Franz Anton Mesmer (1733-1815), excerted an enormous influence on the beau monde as well the general public of France. Ten years before the outbreak of the French revolution his ideas captured the imagination. He attributed his healing power to manipulating a fluïdum: animal magnetism. He worked with trance-induced states on subjects called somnambules. His occultism became generally accepted, except for the members of the scientific community with whom he always was at war. Other occult brotherhoods like Freemasonry, Rosicrucians, Kabbalists, Swedenborgians and alchemists thrived, as did spiritualism. The healing aspect receded in the background, communication with spirits of the deceased, work with magical symbols and building a new vision of reality came in its place. This flight of ideas, its conflict with established order and aristocracy became the breeding ground for the French Revolution. 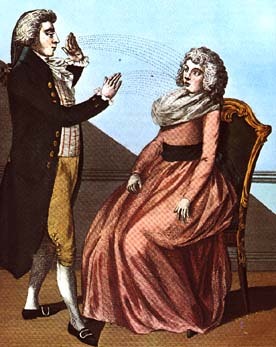 Some of its leaders were once steeped in the world of mesmerism.